If you know who Philippe Conticini is then you’ll know he’s an icon for modern patisserie in France and if I can even go as far as saying he’s a celebrity, frequently appearing on various reality television programs likened to MasterChef. His boutiques alone pull in an audience – a decor of circus meets art gallery, that is, it’s entertaining, playful yet serious for the work is masterful and artistic. Desserts are displayed inside glass domes or bells, cloche in French, which are attached by wire from the ceiling. 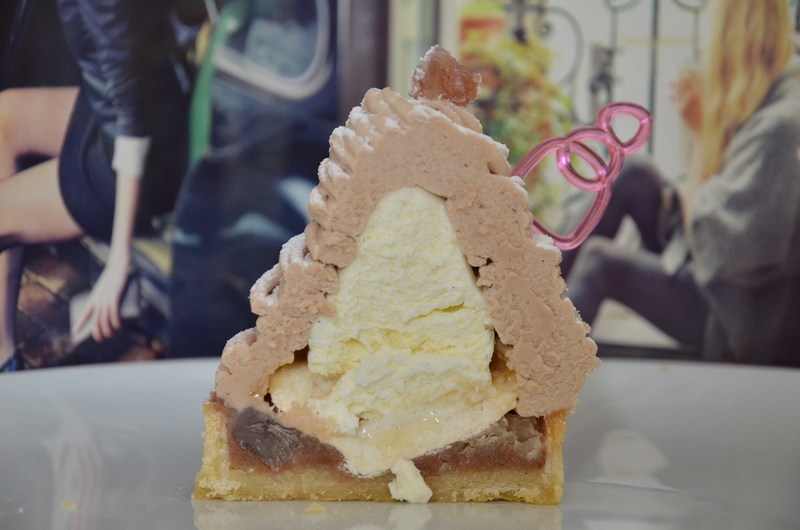 The pink theme of the boutique definitely says that the world of patisserie through Conticini’s eyes should be fun. La Patisserie des Reves is that, it’s the pastry of dreams and who likes to dream more than ever than the child within all of us. Being a chef of modern patisserie means adapting the grand classics to today’s tastes. For example, using less sugar, less butter, less heavy creams, sourcing higher quality natural ingredients such as a Tahiti Vanille, using aromas normally unfamiliar to the traditional French palatte like lychee or yuzu and marrying aromas to create new saveurs like a mix of lychee and raspberry. Like perfume, the grand classics of patisserie must stay true to their origine but to be in demand it must evolve with the period it lives. French patisserie must also recognise that it has a larger international audience with a new growing market, Asia. Philippe Conticini has two stores in Japan, in Kyoto and Osaka. Mont Blanc (below) – the white mountain so famous for its ski destination and why this dessert is made during only the European winter season. Chestnut cream outside perfumed with armagnac. The interior made up of a light whipped cream with X-factor aromas over a soft merinuge lying on a base of puree of chestnuts. I don’t think my description even gives it justice. 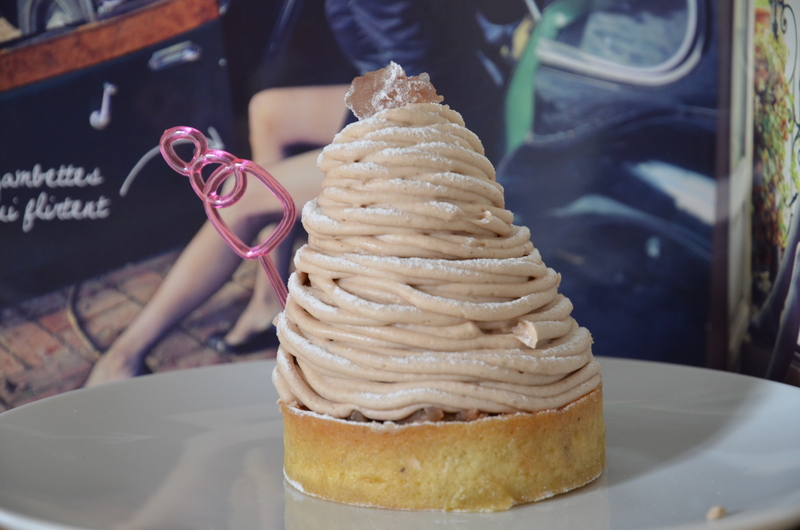 If you are not a Mont Blanc fan, then I would say make an exception to try this one. You’ll be pleasantly surprised. Vanilla Grand Cru (below) – Philippe Conticini is famously known for adapting the grand classics, but he’s also known for inventions, creating original patisserie such as the Grand Cru. It sounds like an aged wine but this pure 100% vanilla pleasure. The Grand Cru is built on a vanilla biscuit base, and the heart is a black vanilla cream, yes, black! 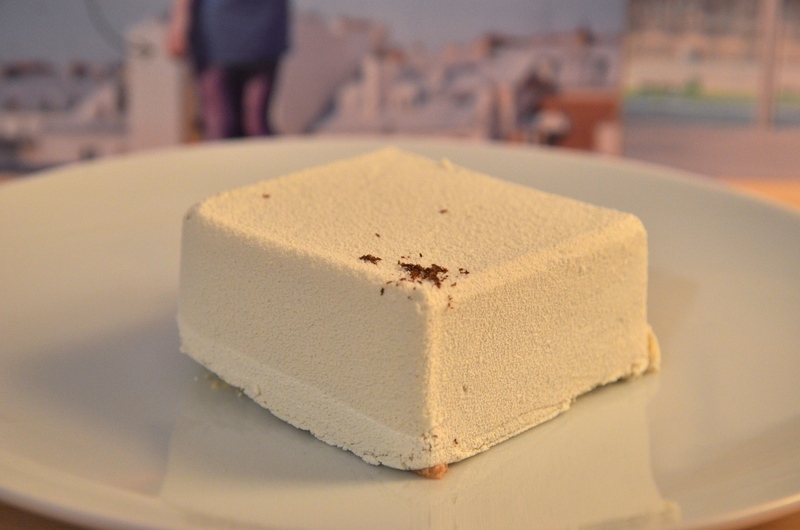 The outer is a heaven of vanilla mousse cream. There is so much more to this dessert, but I don’t wish to give away all the secrets. I’ll leave it there. Just enjoy. Saint-Honore (below) – It is possibly the adaptation of this grand classic (traditionally round) that has made Philippe Conticini known to a larger audience. This Saint-Honore’s mille-feuille is rectangular and not round, along the puff pastry base are 2 eclairs and 3 toffee covered choux each filled with a light vanilla pastry cream, and for the final signature is a ribbon of whipped cream running along the length of the mille-feuille . Conticini explains that this Saint-Honore should not be eaten too cold, this way you get the best of flavours such as the intense vanilla bean. Tarte à l’orange douce (below) – Conticini adapts the fruits to the season, for winter it’s Tarte à l’orange. The base is biscuits of hazelnuts (noisettes). The tart gives a soft acidity and light bitterness rounded by the orange cream. The idea with seasonal tartes is really to bring out the natural fruit flavours by choosing quality fruits at their maturity. Pamplemousse dessert – This is light, moussy and absolutely delicious, however I think this dessert is seasonal. These cakes were bought at the Beaugrenelle boutique and took the train with me. Thankfully survived the journey home. Photos taken by me shortly after.